The first week of October found your five elected Delegates in Raleigh, NC at the AMTA National Convention. On Wednesday night delegates spent a few hours in the Preliminary Meeting to walk through the procedures and plans for the Business Meeting the next day. They heard John Combe's (Chair of the HOD Operations Committee) report. 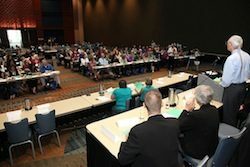 The Mass Chapter contingent was especially pleased to hear that the HODOC had considered the emerging trends in technology and communication online and felt that Delegates should feel free to be creative in getting information to AMTA members and soliciting members' feedback on position statements and recommendations. Delegates received a primer on Robert's Rules and Parliamentary Procedure and practices the whole process with a Mock Positions Statement and Recommendation. Thursday afternoon HOD convened for the 2012 House of Delegates Business Meeting. The session began with a quick welcome from John, some lovely words from National President Cynthia Ribeiro, and the Pledge of Allegiance led by outgoing HODOC member Shirley Cooper. There was role call to establish that all of the 141 possible Delegates were in attendance, and an efficient motion and acceptance of the proposed agenda. Then the real work began. Robert's Rules allows for very organized discussion, but it still took the house nearly thirty minutes to conquer the next task, approving the 2012 Rules of Procedure. The Position Statement Proposal on Low Back Pain was passed swiftly with no debate. Next up was the Position Statement Proposal on Public Health Initiatives. There was plenty of debate on this statement, with nearly equal amounts on each side. Some delegates felt that the statement was too broad, addressing only general health, and that the research cited was not specific enough on the benefits of massage. Delegates on the 'pro' side felt that this statement was key to moving massage into the realm of twice a year dental cleanings, now unquestioned for health maintenance. In the end the proposal did not pass. The Position Statement Proposal on Massage and Health was the third to be discussed. Delegates not in agreement with the statement felt to was too broad and vague. Some felt it was redundant, as previous HOD's have passed statements addressing particular health issues more specifically. Proponents argued that the term "Health" is itself a broad idea, and the statement should be viewed as flexible, not vague. After considerable debate, the proposal failed. The Position Statement Proposal on Massage and Sleep passed fairly quickly. Opponents were concerned that the statement would convey the notion that all massage is effective for improving sleep, which is certainly not a desired outcome in many aspects of the field. Overall, those delegates who spoke in support of the statement were pleased with the consistence of results showing the efficacy of massage in the studies cited. The debate over the Position Statement Proposal on Massage and Fibromyalgia began with an interesting comment from Steve Cody, a delegate from Arizona. Speaking in opposition to the statement, he noted that the statement includes the phrase, "…treatment plan for those who suffer with fibromyalgia…" and that the term 'suffer' describes an emotion, rather than a level of physical discomfort. Those speaking in favor of the statement pointed out that many practitioners use this term in speaking with patients and therefore it was called for and used appropriately in the statement. After short debate the statement was passed. The Position Statement Proposal on Therapeutic Massage for Burn Scars was the last to be discussed (and the motion to approve was seconded by our very own delegate from Massachusetts Kate Peck). There was lengthy debate on this statement. Opponents raised the issue of scope of practice in dealing with wound rehabilitation, and the use of varying terms describing specific massage techniques in several studies. Proponents explained that the research was carried out on a global scale, in many different countries, and that the varying terms were language and translational issues, that all the terms used referred to massage proper. Also noted was that in two thirds of the research cited, the massage techniques were performed by actually massage therapists, (versus physical therapists, occupational therapist, nurses, etc.) After debate that almost ended due to the 20 minute time constraint, the statement failed. There were two recommendations to be voted upon by the House. When a recommendation is approved, it is considered a suggestion give to the National Board of Directors to be considered and acted upon. The first recommendation involved allowing a delegate to complete a two-year term, if for some unforeseen reason a delegate experiences an emergency and cannot fulfill their duties in the House on their first term. The House passed this recommendation. The second recommendation involved National AMTA providing reimbursement for expenses to those state chapters conducting school visits. It was noted that for many smaller chapters with a limited budget, school visits may cause a financial hardship, especially when a state is geographically large and travel can be extensive. This recommendation passed. The five elected delgates from Massachusetts report having a great time serving in the 2012 House of Delegates. You'll be hearing much more from the delegates in future blog posts and the next Newsletter.